Every leader must be a learner. Why? Because no leader has all the answers. Therefore, a leader must constantly be learning to improve and grow. In fact, if a person refuses to learn, he has effectively limited his ability to lead. This is the reason hunger is so essential for leadership because only a hungry person will keep striving to learn more. Are you a hungry leader? Are you humble enough to know that you don’t know everything? Are you willing to read, listen, and associate with other leaders in a community in order to improve yourself? The LIFE community is what makes LIFE’s leadership better than any other leadership company. LIFE’s leadership materials supply people with topnotch leadership teachings, but even more importantly, it’s the LIFE community that provides the environment in which to apply the leadership principles daily. Tim and Amy Marks are one of the Founders of the LIFE Business. This couple exemplifies the results possible for those who are willing to grow and change. Tim, when he started his community, struggled with reading. In fact, his elementary school teacher had told him that he would never be able to read because of his early struggles with comprehension. Thankfully, Tim’s dream was bigger than his dyslexia and he changed the alleged facts. Tim is now an avid reader and voracious learner. Moreover, through sharing his story, he has helped thousands of men step up to lead their families. Amy struggled with low self-worth, leading to severe eating disorder. Indeed, there were days where she didn’t eat at all. However, by God’s grace and a loving community, Amy has overcome her eating disorders, becoming a true servant of others. She has become one of the most respected and in-demand speakers in North America, connecting with men and women going through their own personal challenges. Tim and Amy’s courageous leadership catapulted them to TEAM Policy Council in 31 months! This is the record for the fastest growing community building in the TEAM’s history. Although the Marks’ business grew at a torrid pace, it’s their character that is the most impressive. This couple does the right thing because it’s the right thing period. It’s easy to partner with a couple of this caliber, since one will always know where Tim and Amy stand based upon principle. For example, during the middle of the Team’s freedom battle from our former supplier, the Team community dropped from over 16k people attending events to less than 8k. The drop in numbers put massive financial stress upon the leaders, not to mention the added millions spent on legal bills. Nonetheless, Tim volunteered 100% of his Team profit sharing for over two years, in order to help fund our legal team. Without this selfless act, there would be no LIFE Business today. Few people would sacrifice personally to this extent. Thankfully, Tim and Amy are part of that few. In the middle of these stressful times, the PC tapped Tim with a huge additional assignment. Our All Grace Outreach (AGO) CD and book series and the AGO charity were in serious trouble financially. While the TEAM lost half of its numbers, the AGO series lost significantly more. The PC sought a leader who understood the TEAM community’s needs and could help select the speakers and books to provide the spiritual nourishment for the community enduring its desert experience. Tim stepped into the gap and launched an amazing turnaround of the AGO series and charity. Leaders make decisions based upon data. Tim applied this principle to the AGO series through the saying, “In God we trust, all others must have data.” The data called for change and Tim’s leadership turned around the program. Although the overall TEAM community has grown rapidly, moving past 16k people attending events again, Tim’s leadership of AGO is even more impressive. The AGO series is ten times larger today than it was when Tim assumed the All Grace Outreach helm! Author Jim Collins has a famous saying, “Get the right people on the bus and the wrong people off the bus.” Assigning Tim Marks for leadership of AGO was one of the PC’s best decisions, especially when one considers that 100% of all AGO series corporate profits are given to the AGO non-profit charity. The AGO non-profit ensures crucial operating funds for many worthwhile Christian organizations. 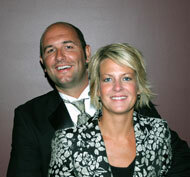 Tim and Amy have grown into one of the top leaders in LIFE and are Quad-PCs in TEAM. They deserve a huge thank you from the LIFE TEAM communities for their sacrificial leadership and commitment to excellence. Moreover, Laurie and I count our friendship with Tim and Amy Marks as one of God’s invaluable gifts to us. Indeed, many times, through the crushing pressure and stress of war, it was Tim and Amy’s encouragement and Christian love that kept Laurie and I moving ahead. Laurie and I extend a heartfelt congratulations and sincere thank you to Tim and Amy Marks for being people of character, honor, and excellence. The Marks’ family has earned every single financial blessing they have today. They live in a stunning mansion in the Cape Coral, enjoying their financial freedom with family and friends. They are truly a modern day success story and a couple worth modeling. Tim and Amy give hope to every person in LIFE, that through character, hard work, and perseverance, nearly any dream is achievable. The LIFE community eagerly awaits the release of Tim Marks’ first book, The Voyage of a Viking, in which he shares life lessons learned from his dreams, struggles, and victories. However, as I noted in the first two articles (Middle Class Squeeze and the Idle Rich & Idle Poor), Jefferson’s dream is certainly not today’s reality. When a person is confronted with this sobering truth, he can respond in one of three ways. His character is revealed by the path chosen. Middle class leaders are Missing In Action (MIA) or more accurately, (MII) Missing in Inaction. The elites have worn down the middle class through excessive taxation and regulations, making the temptation to surrender to handouts look more appealing daily. One of the most shocking facts about the rigged game is the “Idle Rich” want and need the “Idle Poor.” For without them, the “Idle Rich” could not put the squeeze on the working middle class.